The Hidden Radio has officially moved from Kickstarter dream to real-world reality. 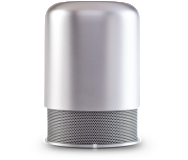 Launched as a crowd-funding project back in November 2011, the Hidden Radio is a portable, rechargeable Bluetooth speaker and FM radio. On Wednesday, the first 10,000 units began shipping to Kickstarter supporters, and the company will begin accepting preorders at its website for new customers. Those new orders will ship in October. That built-in battery should offer 15 hours of continuous listening at the Hidden Radio’s maximum volume, the company claims. That’s down from the 30 hours of battery life the initial Kickstarter project promised, though the 90-decibel output improves upon the original 80dB goal. “We felt that was a good tradeoff,” Van Den Nieuwenhuizen said, since customers won’t need to tote around replacement batteries, and the overall audio quality will be better. The speaker’s clever design lacks volume controls or a power button. To turn the Hidden Radio on, you lift the cap; to make it louder, you simply lift the cap further. The Hidden Radio charges via Micro-USB. Currently, the silver and black models are each priced at $150, with the white model at $180. Each of those prices will increase by $40 after September 30. 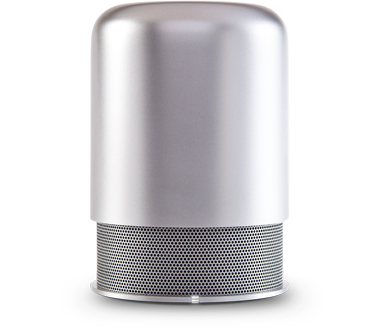 Macworld will publish a full review of the Hidden Radio once our review unit arrives.